Listen, I'm sure you have heard of this game already. 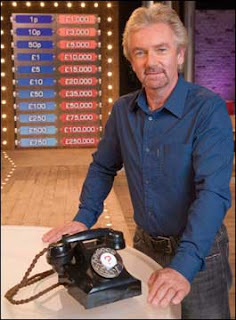 Deal or no deal. It's an entertainment show where a group of twenty-odd contestants pick twenty-odd boxes at random. Each of these boxes are assigned a certain amount of money to them. In which a single players is chosen to 'remove' a box at a time, which will either increase or decrease their overall stake whilst battling a telephone bound banker. In turn, the banker pits wits his with this player, and tempts them with offers to pry them away from their own chosen box. Silly old cow! She bloody lost it on the way home anyway. My Nan picked a fight with a policeman and they charged her for being such a red-head. Or is that hot-head? Nonetheless, she should have waited for me to tell her about what Endemol - Deal Or No Deal production company - had in store for their international based game. Or 'Gioco' is you are of the Italian persuasion. You see, they have a really nifty on-line version that you should check out. It's very addictive. And reminds me very much of it's television counterpart. Just without having all the fan-fare and the deliberate delays. Honestly, when you have the time, give it a click or three, and you will be swept up in the majesty of chance, suspense, enjoyment, plus fun-fun-fun. Go on! What have you got to loose? Click to win. Escape to lose.